This cottage, located in Moye, above Rumilly in the canton of Albanians is on the slopes of Clergeon (1025m), facing the Mont Blanc; it is surrounded by meadows, orchards and woods. This place has retained its charm and authenticity without sacrificing comfort ... You can enjoy the tranquility of the place or go on an excursion in the nearby cities: Annecy, Aix les Bains, Chambery or Geneva ... unless you prefer mountain hiking in the Aravis massif, the Bauges or around Chamonix. You can choose to open water swimming with, for example, Lake Annecy and Le Bourget. In winter, skiing or tobogganing is possible after an hour's drive. 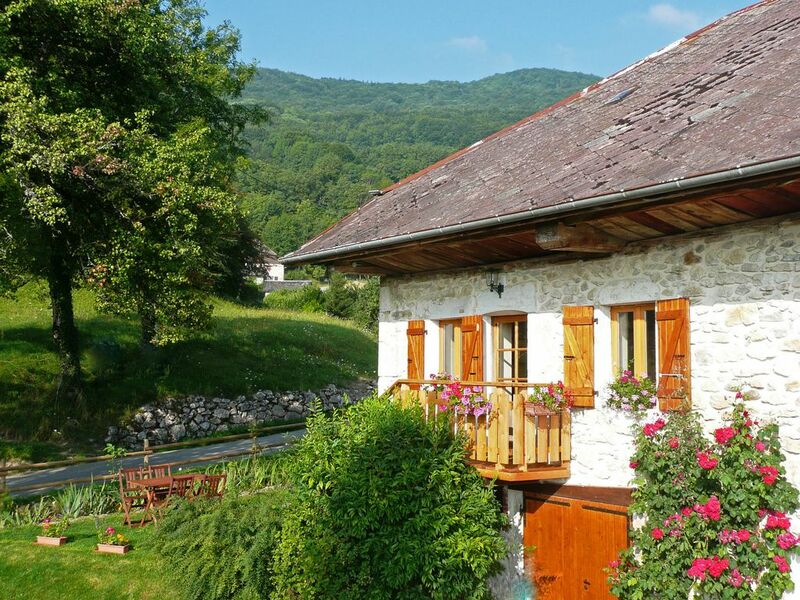 The gite is comfortable and cosy, in a lovely rural location. The owners are friendly and welcoming. Its in a great location for exploring and relaxing. Thankyou, we had a lovely time in this beautiful place. Helpful hosts. Gite has all you need for relaxing stay. Garden with table and chairs for sunny days and log burner for chilly nights. Train to Annecy and Chambery from nearby town of Rumilly. A great location. So peaceful and with a view of Mont Blanc! Great hosts with just the right mix of bring unobtrusive but there to help. If you want to wind down, the ideal place to do so. We stayed at this gorgeous gite for 4 nights with our 1-year-old daughter. We absolutely loved it! The owners were extremely welcoming - and we really appreciated the fresh lettuce from the garden, and the jam and the wine. It's in a beautiful rural location with fantastic views to Mont Blanc etc in the distance. And it's really well positioned for exploring the surrounding area - with the stunning Lac D'Annecy to the east and Lac du Bourget to the west. Our daughter enjoyed playing in the garden and there are lovely walks through peaceful meadows just minutes from the front door. Inside, the property has been lovingly and sympathetically renovated. The decor is simple and stylish and there's plenty of space. A lovely place - would highly recommend it. Séjour dans un gîte exceptionnel. Très chaleureux, décoré avec soins et goût. Toutes commodités disponibles. Région magnifique, proche d'Aix les bains, Annecy et Genève. Merci encore Marie Hélène pour votre gentillesse et les cadeaux de bienvenue. vacances très agréable dans ce gite lumineux et confortable .cadre magnifique et propriètaires discrets.